Opening Day finally came, and that means fantasy baseball is already in full swing. Fantasy Baseball Cafe is here to combine the highlights of the week, and the possible effects it had on your fantasy teams each week. If you had Adrian Gonzalez this week, enjoy your week one win. If you had Clayton Kershaw, you are not enjoying the 5.84 ERA in two starts. It must be painful to get your home run taken away on Opening Day. You were about to be on pace for 162 home runs, and just like that Cespedes-Trout come out of nowhere and tell you what kind of season you are going to have. Logan Morrison and Kurt Suzuki were victims of robbery on Opening Day, your deep sleepers go unnoticed yet again. Matt Harvey went six scoreless innings, striking out nine, to beat Washington on Thursday. He was absolutely filthy, and for those who snagged him in middle rounds, you got yourself a top tier ace as expected. It sure makes that Kershaw pick look questionable, just kidding, Kershaw is awesome. Boston chased Cole Hamels early on Opening Day, with four home runs off the lefty. Hanley tacked on a late game grand slam, and Buchholz cruised to an easy win.Great sign for all those fantasy players who drafted heavy Red Sox. 2. Is This Why Derek Jeter is 2% Owned On ESPN? If you haven't noticed, Derek Jeter is 2% owned on ESPN still, this may be why. Andrelton Simmons with a Jeter-esque play against the Mets, may have some fantasy players believing Derek plays for Atlanta. I am also assuming there are some people who just don't know how to let go. Gonzalez is hitting .667 in five games, with five home runs. His three home run game against San Diego sent the fantasy world into hysteria. I somehow face two players who have Adrian Gonzalez next week, so please cool off! I can't tell you if Ozuna was trying to sell this, or he actually thought he made the catch. 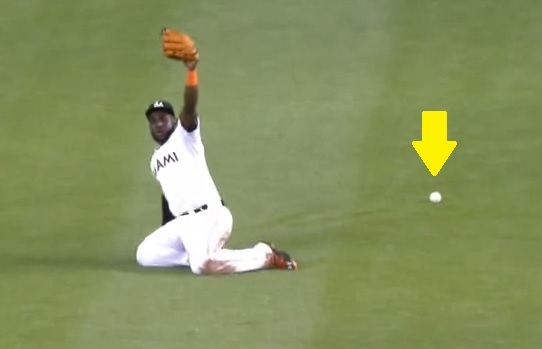 Unfortunately Marcell Ozuna has surfed the internet and reported all videos of this "catch" as spam, the picture still does its justice. The Marlins have set the bar for walk-off celebrations, as Dee Gordon posterized Christian Yelich after his walk-off hit. It is also good to see Mat Latos, after his poor start, to be of some use to his teammates.